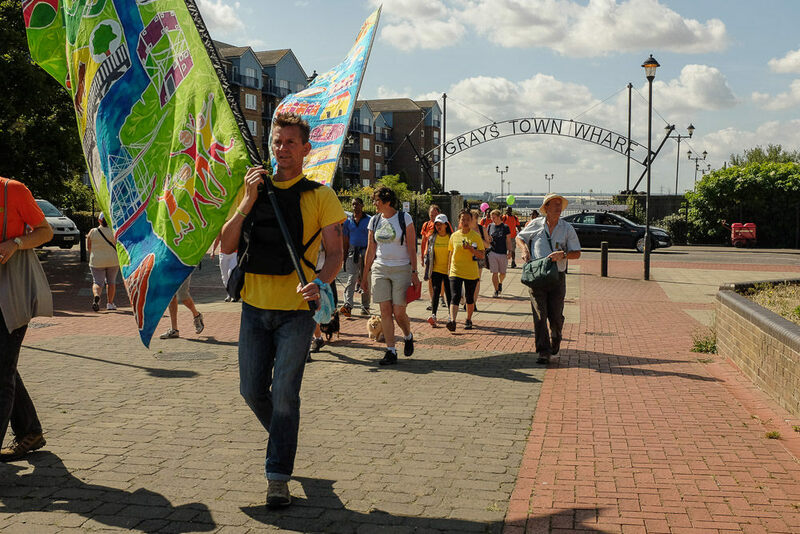 Thurrock 100 2016 was a walking festival with a difference – 10 days of walks and talks exploring Thurrock’s rich (and sometimes forgotten) heritage as told through 100 stories that you could meet along the way. This year’s walks ranged from 1 mile to 12, from gentle evening rambles to more strenuous weekend hikes, with 21 walks of different lengths, durations and difficulty, plus two walks especially for schools. In all, over 1,700 people took part in the walks over the 10 days, and Thurrock 100 looks certain to become a regular fixture! Thurrock 100 Stories 2016 ended with a colourful mass performance by over 100 Thurrock schoolchildren from across the borough who used the 100 batik silk flags created in the course of the project as part of a vibrant finale choreographed by one of the UK’s pre-eminent mass dance leaders, Jeanefer Jean-Charles, and her team. The performers were joined by 50 people who had walked from Tilbury Fort to Coalhouse Fort in the final event of the walking festival, and by the Thurrock Marching Band. An audience of 400 people watched the performance in the sweltering Coalhouse Fort. Local history and community groups, residents, 19 schools, and no fewer than 500 students, took part in workshops to collect and write the stories, with a further 216 people coming to paint the flags at Kinetika’s studios. Overall, more than 3,000 people took part in the project this year. You can see a short film of the finale here, and there’s a gallery of photos here. All the stories and images of the flags can be explored online through a new interactive story page available at www.thurrock100.com, and a book containing all 100 stories and the flags will be published in the autumn.